I’m still loving Fall, especially because it’s not even October yet! 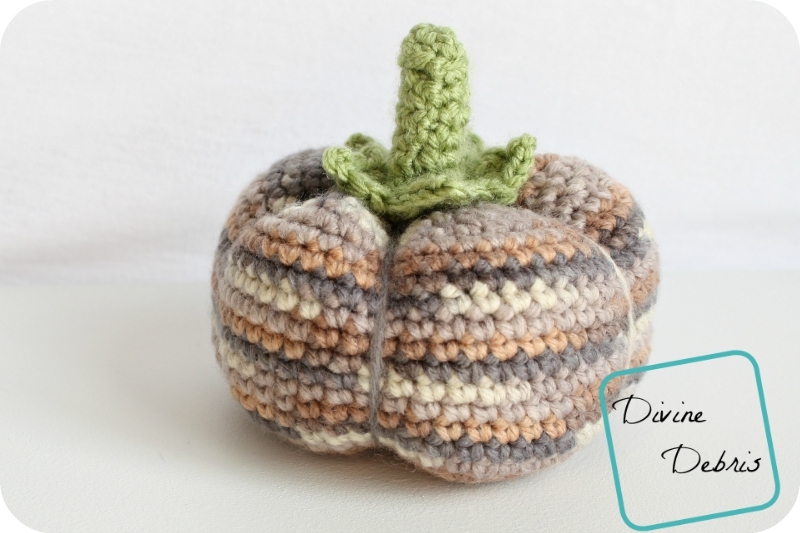 So, this week I have another Fall themed pattern for you. Are you excited? Sure, sure, it’s kinda your typical Fall decoration, but it’s a standard for a reason. Yep, that’s right, I’m talking about pumpkins! These lovely little things can be easily adjusted to be larger or smaller, if you’re into super tiny crochet, and if you wanted to get crazy, you could even add faces to them! The idea for this project came to me when I was walking around Michael’s and saw that their Loops and Threads Impeccable was on sale. 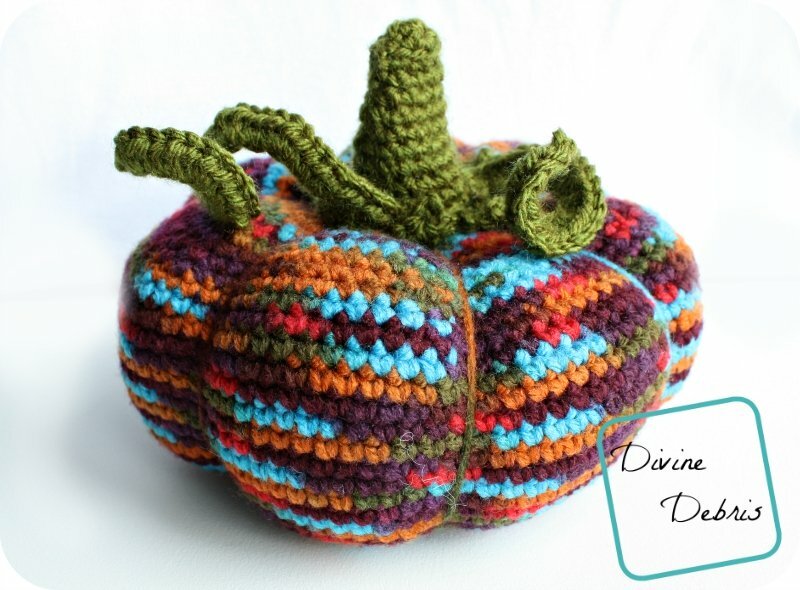 The colors I used for this pattern are not standard pumpkin or even Fall colors and that’s what turned my head. 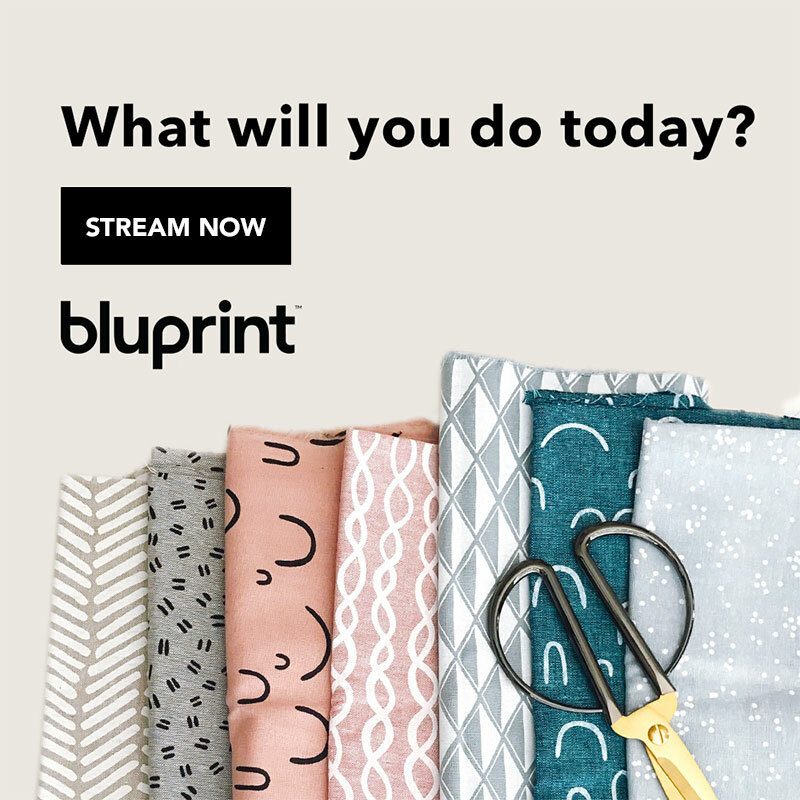 I was super excited to create this pattern because I love the colors. You could totally make an orange pumpkin but, you know what? Get crazy! Make a purple pumpkin! The ch 1 at the beginning of the rows does not count as a st. This pattern is worked in the round, with a slip st into the first st. If you want a larger pumpkin, make more increase rows (the ones where you add sts to the row) following the same pattern, increase the side rows (the ones where it’s the same st count row after row) and make sure there are the same amount of decrease rows (where you sc2tog) as the increases. Instead of a sc2tog you can do an invisible sc decrease. It is completely invisible in the finished outcome. You need to know how to work into the back loop only for this pattern. Note: weave in the tail from your magic circle here. Fasten off. Leave a LONG (like 84″ – 85″) tail and use that to close up the hole on the top and then go through the center of said hole and direct the needle out the bottom (in the middle of the magic circle). Go around the outside of the pumpkin (pull this tight) and go back down through the center of the top, navigating the needle through the middle of the pumpkin and out the bottom. I did this 7 times, you can do this as many times as you want to get the puffy pumpkin sections. 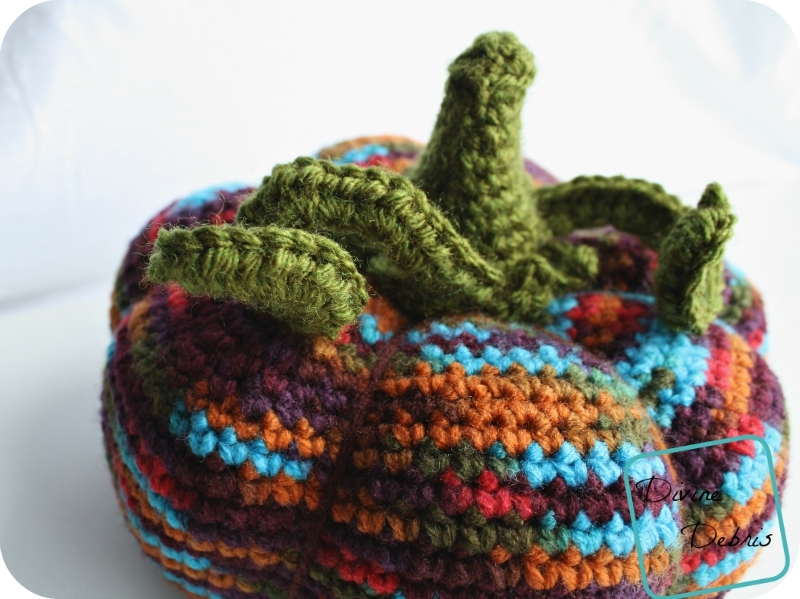 Once you did all your sections, weave in your yarn on the bottom of the pumpkin and move onto the stem. Fasten off. Leave a LONG (like 35″ – 36″) tail and use that to close up the hole on the top and then go through the center of said hole and direct the needle out the bottom (in the middle of the magic circle). Go around the outside of the pumpkin (pull this tight) and go back down through the center of the top, navigating the needle through the middle of the pumpkin and out the bottom. I did this 7 times, you can do this as many times as you want to get the puffy pumpkin sections. 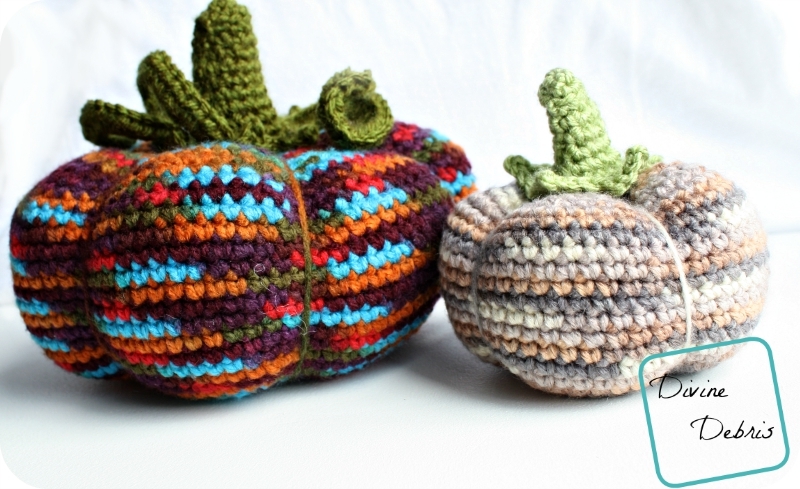 Once you did all your sections, weave in your yarn on the bottom of the pumpkin and move onto the stem. Note: This next row is worked into the back loop only. Fasten off leaving a tail that’s at least the 6″, use this tail to secure the stem to the top of the pumpkin. Trim all your ends. Fasten off leaving a tail that’s at least the 4″, use this tail to secure the stem to the top of the pumpkin. Trim all your ends. Leave a long tail, use that to secure the tendril to the pumpkin stem. This tendril is easy to adjust and make larger or smaller, it’s really up to you. I can’t wait to see all the lovely pumpkins! Make all of the pumpkins and share some photos with me! 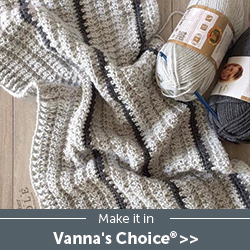 This post is linked to Oombawka Design’s Link and Share #112, Rebeckah’s Treasures Saturday Link Party #15, Hookin’ on Hump Day #104, and Linky Ladies’ Community Link Party #19. First Stop On The MMM Blog Hop! These are the cutest pumpkins have seen!! !…and believe me I’ve seen plenty of pumpkins! 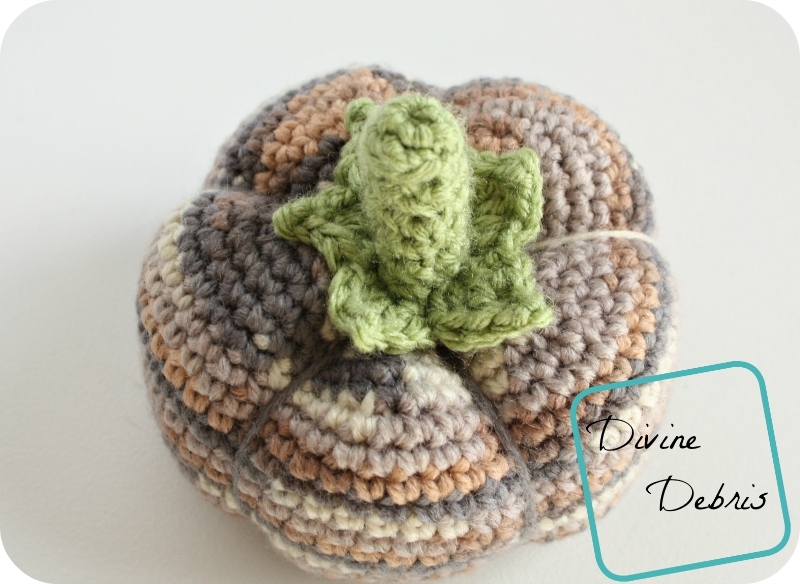 Thank you so much for sharing your adorable pumpkin patterns! 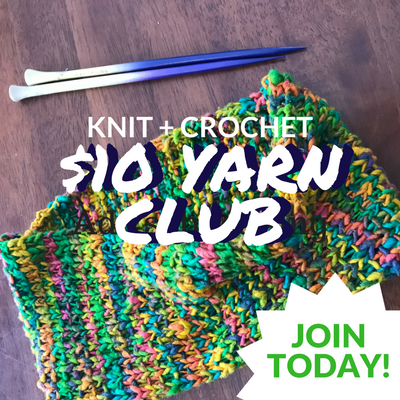 What green colors and brand of yarn did you use???? For the smaller one, it’s Loops and Threads and the larger I think is Caron United but it was just a little ball leftover from a previous project.